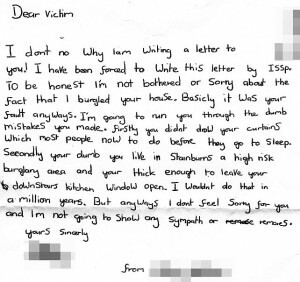 That was a young burglar’s response to one of his victims. 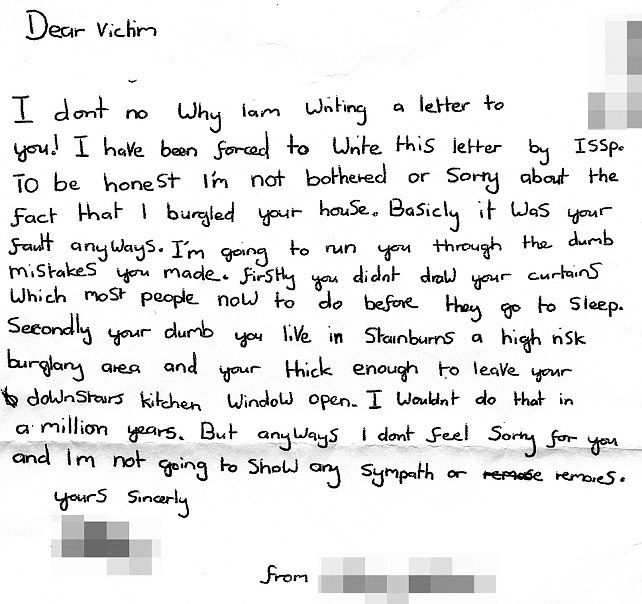 Forced to write a letter to the family he stole from, supposedly to apologise for his crimes, he said that he didn’t feel any remorse because they were ‘dumb’ and deserved to get burgled because of their careless behaviour. He based this on the fact that they left their curtains open at night so he could see whether there was anything worth stealing and that, even despite living in a high crime area, they failed to close their kitchen window overnight. In his opinion they were just asking for a break in. You can see the full wording of the letter below or click here for the news report at the time. Clearly this is a horrible response to a family already upset by this incident (the letter was intercepted and never made it them) from someone who clearly has no empathy or remorse. However, is there some element of truth in what he’s saying? We all know how to protect our properties and there are lots of common sense measures we can take to do that – having an alarm, closing windows, locking doors, not leaving valuables on display etc – and yet so many homeowners are extremely complacent to the risk of a break in. While we would never agree with this reprehensible young man’s attitude that they deserved to be robbed, they certainly made it easy for him. Too many people think that these things usually ‘happen to someone else’ and they’re either very trusting or just a bit slack in following basic home security – would it have taken much effort to just check that all curtains and windows were closed? Sadly it often takes an incident to sharpen people’s focus – we’ll bet that the family in question don’t leave their curtains open now and we wouldn’t be surprised if they have a burglar alarm fitted as well. Next time you’re going up to bed or leaving the house just consider the way this callous individual laughed at his victims and maybe you’ll be a little bit more mindful of making those last minute checks? next The aesthetic beauty of… an alarm bell box?